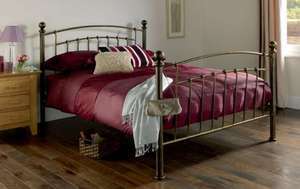 A classic wrought iron bedstead available in a choice of antique brass or antique pewter. Dimensions of bed in cm: (H) 112 (W) 148 (L) 203. Clearance between floor and underside of bed in cm: 32. Material: Wrought iron bedstead with metal struts. Effects and finish: Antique brass finish with brass finials. Matching items available: Luxury Velvet Stripe Cushion - Purple - 60x40cm (724366), Ruched Shot Satin Cushion - Cream - 40 x 40cm (116626), veryday Ruby Red Percale Embellished Duvet Set - Double (1367728). Also available in antique pewter (1786378).